I don’t need to tell regular readers of this blog that dealing with the symptoms of the condition that affects you or your child is often only half the battle. People affected by rare diseases are up against it in a variety of unique, but sometimes predictable, ways. Whether you’re in a battle of wills with your local authority over your child’s needs at school, or with the DWP about what financial support you are entitled to, nothing seems to come easily for those with rare conditions. Recently at Genetic Alliance UK, we’ve been looking at one specific challenge that rare disease patients face: the ‘hidden costs’ of having a rare disease. The word ‘cost’ often means money, but that is only part of what we’re talking about. 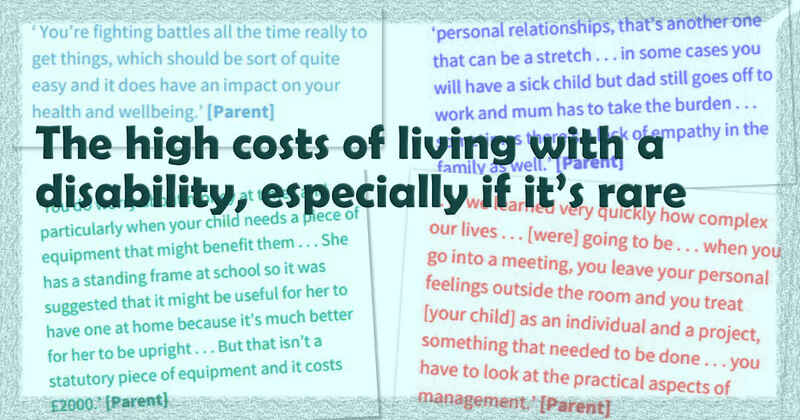 We’ve also looked at the psychosocial costs involved in having a rare condition. It feels like common knowledge in our community that, of course, having a rare, complex condition is expensive. But actually, almost no research has been done into this, no one is monitoring how much money it costs you to travel up and down the country multiple times a month. The psychological burden placed on families who have to fight every day just to get the services they are entitled to isn’t measured. This means that when services are designed and commissioned, these extremely important aspects of life with a rare disease just aren’t considered. We’ve conducted some research to try and determine the extent of this problem. Participants described to us the financial costs that they experience, including things like travel expenses, days off work (or leaving work entirely), prescriptions, specialist equipment and activities, childcare and respite care. The more appointments a family has to attend, the more money it costs them in travel, childcare, days off work etc. Therefore, it is obvious to most people with a rare disease that it would be considerably cheaper for them if they were able to see a range of doctors within one multidisciplinary clinic on one day, as opposed to having to attend multiple appointments on different days, in different departments. Some people are able to feel the advantages of a well thought out service like this but many areas don’t have this kind of service and therefore some families miss out. Money is not the only cost that families face. Time was a huge cost to patients and their carers who described themselves as full time ‘care coordinators’ and ‘project managers’. Lack of communication between providers and between services and families was a similarly massive issue. Often it is the families that facilitate communication between all the different departments and professionals that are involved in their care. As a result they spent time everyday, not just attending appointments but making calls, writing emails and chasing the staff that are meant to be providing their care. For many, these types of demands impact on every aspect of their lives including their ability to work and their relationships. The way that patient care is organised and coordinated has a significant impact on the cost of managing a rare condition – not only for the NHS but also for patients and families. The ‘hidden costs’ that we’ve looked at are not currently collected or acknowledged by NHS commissioners and so decisions about services for rare disease patients are often made on limited evidence. I think it’s pretty straight forward, if decisions are made without all the evidence possible, they can’t possibly be best for patients, or NHS budgets. It’s vital that these types of costs are recognised by those organising health and social care services so that they can be reduced for patients and families. Further research is needed to quantify the full costs associated with different types of care for rare disease patients. Having information like that would be invaluable to NHS commissioners when they are developing services, and deciding which would be most cost effective and valuable to patients. We’re hoping the Hidden Costs of Rare Disease feasibility study will act as a springboard for us, and others, to generate data on the cost of having a rare disease to be used to improve the lives of rare disease patients, their families and carers. Beth McCleverty is the Policy and Communications Assistant at Genetic Alliance UK. She has a masters degree in Public Policy and manages all of the communications at the charity. She also supports the policy work of the organisation, focusing on making sure the patient voice is heard in policy making. Can you help harness parental knowledge about genetic intellectual disability? Hmmm,as long as this report isn’t used to justify the expense of tests to detect these conditions in utero in order to promote eugenic practices that’s ok. The recent declaration by the Royal Societ of Obs and Gyn that the cost of caring children with Down syndrome be calculated in order to justify the cost of NIPT was shocking enough. Thank goodness the systematic review declared that unethical. As they said it is really important when looking at costs to model the QALY gains by the child living also, which then of course adds further ethical issues as to how to value the quality of life of a person with that condition. It’s a minefield, but I do hope the Genetic Alliance will do this at the same time. Hi Colette – The hidden costs study looked at the way services are organised and how this impacts financially and psychosocially on families affected by rare conditions, considering things like how expensive it is to a family to be attending lots of appointments on different days (rather than all on one day as some rare disease clinics facilitate). We’ve looked at what the ‘hidden costs’ are for families to understand how services could be improved so that they would not face these costs. Hopefully this can help improve the lives of families affected by genetic conditions.